Offering king-size beds and an en-suite bathroom for each of the five bedrooms, La Plage is a villa conveniently located right on Lorient Beach. Offering modern amenities such as flat-screen TVs, French satellite service, and internet access, the property is great for couples looking for options. The rear deck offers a fountain, Jacuzzi fit for ten, and a wet bar. With a three-minute drive to restaurants and groceries, the villa offers two kitchens and the service includes continental breakfast, giving plenty of variety of dining options - including a covered area to eat outdoors. La Plage is located on Lorient Beach. There’s a swimming pool, liberally decked with tons of space to sunbathe, dine al fresco-nicely protected from the sun-or just simply relax. A guest bath is conveniently located nearby. Open the sliders and guests will find a living room with a slate floor. There is also a ceiling fan that adds ambiance especially as one looks out to the ocean view, framed by coconut trees. A rear deck has a fountain, a warm Jacuzzi for ten, and a wet bar complete with icemaker. There are two kitchens, one fit for a gourmet and the other available should guests bring a private chef. All five bedrooms are similar in size and luxury, all with king beds, private terraces and luxurious ensuite baths with double vanities and rain-head showers. HDTV’s, dark wood furnishings, and linens and bathrobes of the highest quality complete the vision of comfort these rooms provide. 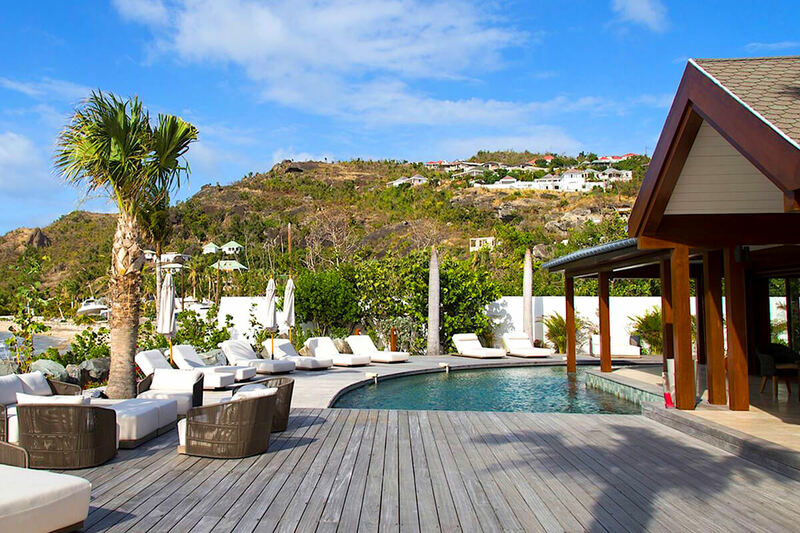 In addition to the five bedrooms in the main house, guests now have the option of renting the villa’s second beautiful building, a two-bedroom beach house that also contains an extra kitchen/living room and patio. This new configuration preserves the villa’s sense of intimacy, and offers increased privacy for larger groups. Home cinema; espresso machine, iron and ironing board, beach chairs, cooler, gas barbecue, umbrella. Children must be accompanied by a nanny.